Aviemore & Badenoch covers the area often known as Badenoch and Strathspey. It includes a broad swathe of Scotland very roughly aligned along the A9, and takes in Dalwhinnie, Newtonmore, Kingussie, Aviemore, Nethy Bridge and Grantown on Spey. For accommodation in Aviemore & Badenoch see the links in the "See and Stay" menu above. See the map below for an outline of the area and links to surrounding areas. Aviemore is a year-round tourist destination, now bypassed by the A9 on its way north to Inverness. It first developed with the coming of the railways in the later 1800s, and then as a ski resort in the 1960s. In recent years Aviemore has done much to overcome the concrete image given it by the 1960s architects. Beside the road into the town from the sotuh is St Aidan's Roman Catholic Church. Just to the south east of the town is the popular Hilton Coylumbridge Hotel. The Cairn Gorm Ski Centre is Britain's biggest ski area with 28 runs and over 35km of pistes. Access is by road and the centre is just eight miles from Aviemore. The CairnGorm Mountain Railway opened at the end of 2001 to replace the old chair lifts. Aviemore is popular with walkers. For the truly adventurous, a spectacular walk starts from near Aviemore, takes in the Lairig Ghru Pass through the Cairngorms and finishes in Braemar. This is not, however, for the faint-hearted, the inexperienced, or the ill-equipped as the whole walk is 24 miles long and runs through some very remote country. Aviemore also lies at the start, or end, of the Speyside Way, the 65 mile long distance path to the coast at Buckpool. On the other side of the A9 from Aviemore is the Craigellachie National Nature Reserve. South-east of Aviemore is the Rothiemurchus Estate, a working Highland estate which offers an insight into land management. Land Rover and tractor tours are available all year and visitors can fish for trout in the River Spey. At Carrbridge, nine miles to the north of Aviemore, is the Landmark Visitor Centre telling the history of Scotland using innovative multimedia displays. Carrbridge itself is well worth visiting, and comes complete with the remains of an old arched bridge over the river. Eight miles north east of Aviemore is Boat of Garten. Nearby is the Loch Garten Osprey Centre managed by the RSPB. The Strathspey Railway runs between Boat of Garten and Aviemore. 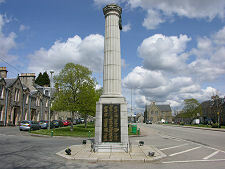 Grantown on Spey lies 15 miles north east of Aviemore and is a popular destination all year round. This is a well designed Georgian town, built to the plan of the laird, Sir James Grant in 1766. The streets are wide and tree-lined with attractive buildings grouped around a central square. It was a favourite with Queen Victoria and its dry, bracing climate was advised as a tonic for those Victorians with a nervous disposition. Today the town has comfortable hotels and makes a good base for summer touring. 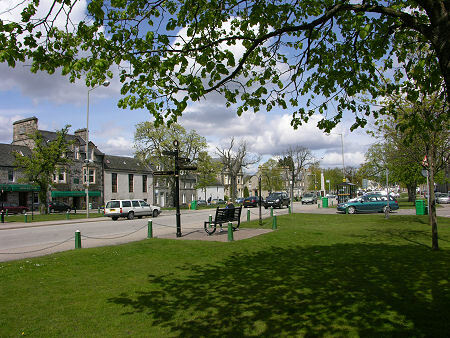 In winter many of those tourists not wishing to engage with the hustle and bustle of Aviemore choose Grantown on Spey. The Speyside Heather Centre, located south west of Grantown on Spey, provides an interesting excursion. To the south of Grantown on Spey, on the less travelled south side of the River Spey, is the attractive village of Nethy Bridge. At the north end of the village is the Mountview Hotel. 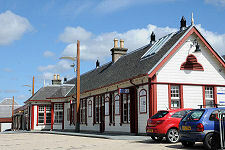 On the opposite side of the Spey is Broomhill Railway Station, the northern terminus of the Strathspey Railway. From here you can catch a steam train to Aviemore. A little north of Nethy Bridge stand the gaunt remains of Castle Roy, close to Abernethy Parish Church. The Abernethy Forest, south of the village, is home to the RSPB's Loch Garten Osprey Centre. Kingussie attracts visitors all year round. Just 12 miles south of Aviemore it is also provides a popular winter destination for skiers. Across the river to the east of the town are the ruins of Ruthven Barracks. 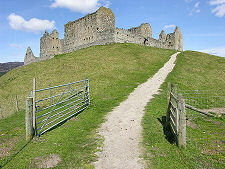 The site offers excellent views of the surrounding countryside and was first occupied by a castle in the 1200s. The Barracks were built in 1721 by the Government as part of a scheme to keep control of the Highlands after the 1715 Jacobite rebellion. See our Historical Timeline for the wider background. 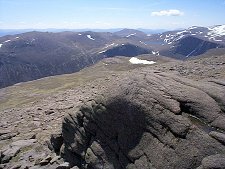 The Monadhliath mountains to the north-west of Kingussie offer some excellent walking. A circular walk starting just north of the village takes in the twin summits of Carn an Fheiceadain and Beinn Bhreac. To the south are the more rolling mountains flanking the Pass of Drumochter. These include the very accessible Geal Charn and A'Mharconaich. Nearby Newtonmore is a linear settlement which benefits greatly from the A9 bypass. A full range of tourist services are to be found here including the excellent Clan Macpherson Museum with its display of clan artefacts. 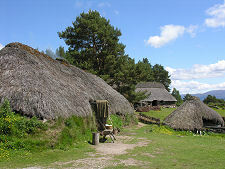 The Highland Folk Museum at the other end of Newtonmore is a superb day out and on its mile long site houses a large collection of buildings which give a fascinating insight into Highland life in years gone by. Twelve miles south is Dalwhinnie. 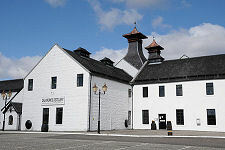 This is home to Dalwhinnie Distillery, by a small margin Scotland's second highest distillery. North from Kingussie, heading back towards Aviemore, the old A9 remains in use as the B9152, making a good alternative route to the modern main road. En route to Aviemore, it passes the attractive little village of Kincraig. Two miles before it reaches Kincraig, a junction gives access to the Highland Wildlife Park, where visitors can experience Scottish wildlife as well as endangered animals from mountainous and tundra regions around the world.